Bartok's Bluebeard's Castle and The 8th Door by Lliam Paterson. 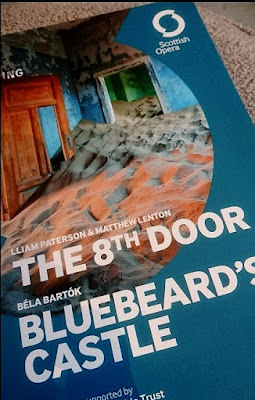 Scottish Opera combine Bartok's one act opera, Bluebeard's Castle with a new piece composed by Lliam Paterson, The 8th Door. Both are produced by Glasgow theatre company Vanishing Point, who were behind National Theatre of Scotland's The Beautiful Cosmos of Ivor Cutler among many other shows. The version of Bluebeard's Castle which I know is from a children's book of "Villains In Myth and Legend" that I used to read regularly. It told the story of Bluebeard's new wife who was forbidden from looking behind a locked door in the castle. When she could not resist she found the floor covered in blood and in a corner the bodies of Bluebeard's previous wives. Bartok's version has the newly wed couple arrive at the castle of the title. Judith asks for all the seven locked doors to be flung open to let in light. Bluebeard refuses; some things should be kept private. If she wants the secrets from the past uncovered, she will need to accept the consequences. The 8th Door is what we are presented with first, a newly produced piece from Lliam Paterson and Matthew Lenton. The six singers are in the orchestra pit, with two actors on stage, seated with their backs to the audience facing cameras which project their faces onto a large screen (Robert Jack and Gresa Pallaska). The pair on stage act out the rise and fall of a relationship, whilst the words of Hungarian poets, in English translations from Edwin Morgan, then as things progress, more often in the original Hungarian. The actors do very well to hold our attention with their everyday misunderstandings and lack of closeness, but there isn't much meat to it. The singing and music follows their mood through harmony and more dystonic turns. It's dramatic and tense, but I would have liked to concentrate on the poetry, or the singing...or the music, or the acting. My focus flitted from one to the other. As an average, modern couple failing to connect, beyond the Hungarian verse and some musical nods to Bartok, their connection to the mass murderer and polygamist of the second half was maybe a bit loose. Bluebeard's Castle had been rendered as a mundane apartment for bass-baritone Robert Haywood and mezzo-soprano Karen Cargill to wander into. The seven locked and barred doors that Judith demands opened are oddly all metaphorical, and they reveal on stage for each one is done with varying degrees of success. The first door, which reveals a torture chamber, rather dully turns out to be Windows as Bluebeard's laptop screen glows red. Has he been watching snuff videos? The words and music are so incredibly tense and dramatic that the setting and scenery was rather disappointing at times. The lack of castle and lack of doors could have worked fine with more bravado, but felt oddly flat. The orchestra played beautifully, at times the brass coming from up in the theatre boxes, bringing a lot of tension to the story and the singing was perfect, particularly that of Karen Cargill. Tense and intriguing, just not as grisly as I was expecting from my days reading the story of Bluebeard as a 9 year old.